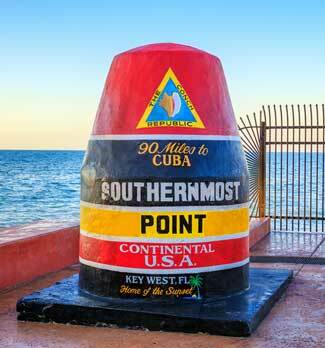 Key West is famous for its warm sunny climate, relaxed lifestyle and many historic attractions. Tour the Ernest Hemingway home or Harry Truman's Little White House, stroll through historic Old Town and explore beautiful tropical gardens. Other attractions include excellent scuba diving, snorkeling, sailing and day trips to Fort Jefferson National Park in the Dry Tortugas. Even though named for the famous painter John James Audubon he never lived in this house. His connection is through his paintings which are shown throughout the home. The home was built in 1840 by Captain John Huling Geiger. The home features period furnishings from the original family. The bricked pathway leads through the garden with more than 200 orchids and other native and exotic trees and plants, definitely a spot to sit and relax. At the corner of Whitehead and South Street you will find a large concrete monument in the shape of a ships buoy stating The Southernmost Point. This location is the closest to the coast of Cuba just 90 miles away. This is probably the most photographed location in Key West as you will see when you stop by to take your own photo. 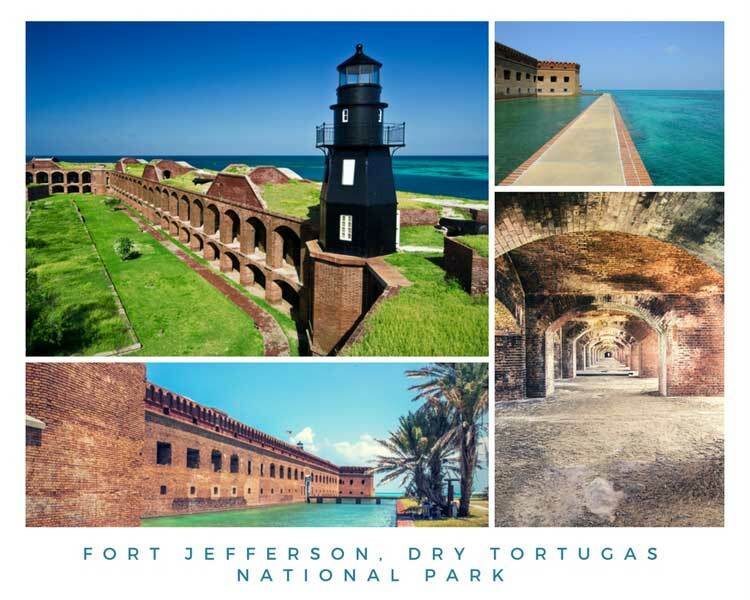 Accessible by boat or seaplane the 70 mile trip is worth being able to explore the 19th century historic Fort Jefferson fortress. Not interested in history? Enjoy the beautiful blue waters to swim, snorkel or dive. You would like an overnight stay, they allow camping also. A definite must for the whole family. Want to touch a Starfish or Sea Urchin? How about feeding a shark? Take a guided tour or just explore the exhibits. You can’t miss the Key West Aquarium, a true family event. Enjoy a day of discovery within 6,000 square feet including interactive exhibits and displays. Explore the ecology of keys habitats and living reef exhibit and the Aquarius exhibit. Bring the family to learn about how the environment affects all living creatures. Want to see a six toed cat? Come to where Ernest Hemingway lived and wrote for over 10 years. Sit where the Nobel Prize winner sat and get inspiration for your own story. Enjoy the guided tour to get all the background information then take time and wander around the grounds to enjoy this legendary home. Located in the Truman Annex since 1890 and named after President Harry S. Truman. Even though other President’s visited the home it was President Truman’s many trips that secured his the title. Think about the president’s and dignitaries that have made decisions here, what history on this small island. Want to see real Spanish treasures that Mel Fisher recovered from the sunken Nuestra Senora de Atocha worth $450 million. The museum provides a viewing of these treasures plus other recovered items from his numerous discoveries. You can also purchase one of the artifacts for yourself.